It's never too early to think about Christmas. We all know by now how much planning is needed for Christmas to go by without any major hiccups, so the best thing to do is be prepared. To do that you need to plan what you need to buy and prioritise. We all love giving presents, and giving presents that those on the receiving end really like is even more satisfying. That’s why it’s better to be prepared. If you go shopping for presents last minute it is more likely you will end up buying things you don’t necessarily think are the ideal present. The other reason it is better to buy presents in advance is they are often timeless. Christmas presents do not need to be associated with Christmas so you can buy them in advance and they will not be old. In fact, it means you’ll probably get something that others haven’t got because you’ve bought it so far ahead. 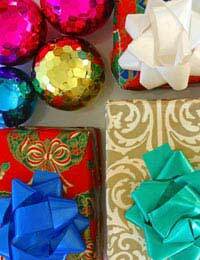 If you are planning to Make Your Own Christmas Gifts, the more time you leave yourself the better. The best time to buy Decorations is early in the year when the Christmas sales are on. At this time you can often find Christmas trees and other decorations at as much as 80% off. In fact, in the last couple of weeks before Christmas you can actually buy decorations at a huge discount. At this point you have probably already put up your decorations so won’t see the point in buying any more, but, if you plan ahead for next year, it’s a good time to start buying. You can, however, actually buy decorations throughout most of the year if you are creative. You do not have to have typical decorations to decorate your house. You can make your own by buying dried flowers and beads and baubles from most haberdasheries. That way, your decorations are prepared in advance and you get to have some original décor in your house at Christmas. Christmas food is obviously one of the few things you must buy during the Christmas season. However, you could still plan ahead now by making lists of what you need to buy and where you need to buy it. Some items will have a long use by date, so can be purchased in early December or even late November. You can make your life easier by using a supermarket's online shopping facility. Start compiling your shop early and save it for nearer the time when you'll actually want to order. In the past people have planned ahead by paying a little money each month into a hamper scheme and then received the hamper in time for Christmas. The hampers include food, decorations and toys. However, in recent years there have been some problems with hamper companies, including one which went bust leaving all the savers with nothing. This has put people off using the companies. But you can still put a little money away each month in order to be adequately prepared by the time Christmas comes along. You could try making up your own Christmas hampers has gifts too, to save money and add a personal touch.